Metro area mayors have endorsed much-debated legislation to cap greenhouse-gas emissions and use the proceeds to develop renewable energy and energy efficiency and prepare for effects of climate change. 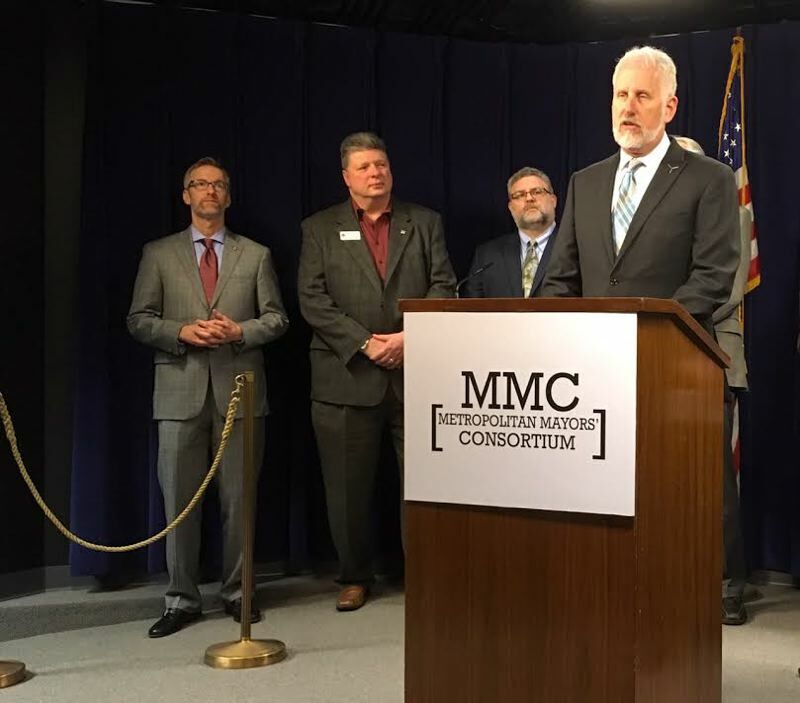 Milwaukie Mayor Mark Gamba spoke Tuesday, Jan. 29, on behalf of the Metropolitan Mayors Consortium, whose 25 members laid out their priorities for the 2019 Oregon Legislature during a press conference in Salem. Gamba referred to a recent report by the United Nations Intergovernmental Panel on Climate Change, which warned that people may have only a dozen more years to head off the more severe effects expected from global warming. "We support the bill because mayors and cities are the ones who will be left to pick up the pieces if we as a state and a nation fail to act boldly to stop climate change," he said. Similar legislation was developed in the 2018 session, but legislative leaders decided to await the longer 2019 session to advance it. It is likely to meet objections from businesses, which raise questions about its costs. Gamba said Milwaukie already has seen the effect of record rainfall on Dec. 8, 2015, that resulted in $2 million in damage to the Kellogg Creek bridge in Riverfront Park — and its eventual replacement last year. "That is the tip of the rapidly mounting iceberg," he said. "Each of us has a different concern about what this bill will mean to our cities. I for one have concerns that it will not be strong or inclusive enough. We must pass this bill — and then we must do much more if we hope to leave our kids with a planet they can survive on." In addition to using fees on greenhouse-gas emissions to pay for energy and transportation projects, Gamba said, cities and counties must prepare for how increasingly erratic weather will affect streets, water and sewer lines and stormwater systems. The bill is among six priorities outlined by the consortium, which is led by Gresham Mayor Shane Bemis. He said priorities often dovetail with those of the League of Oregon Cities and the Oregon Mayors Association. "But the Portland region is unique with the center of population — and different issues come our way that may not come to other parts of this state," he said. "So we wanted to carve out a space that is unique to the region's mayors to get together and make changes on some of these significant issues." Bemis said stances by the consortium require a two-thirds vote. • More state aid for mental health, and maintenance of programs the 2015 Legislature boosted, such as crisis intervention services, emergency access to care, rental assistance for mental health clients and specialized training for police. • Auto theft: They endorsed House Bill 2328, which would reverse the effects of recent Oregon Court of Appeals decisions that make it more difficult to convict defendants caught behind the wheels of stolen cars — short of their confessing to the thefts. According to a 2018 report by A Secure Life, based on FBI data for 236 cities, Portland ranked fifth in auto thefts at 5.57 per 1,000 population and Gresham eighth at 5.11 per 1,000. • Right of way regulation: They said cities should retain their authority to regulate how utilities and others use city streets — particularly with the development of a new generation of cellular mobile communications known as 5G networks — and to receive compensation from them. • Professional services: They want lawmakers to refine a 2011 law that sets procedures for local governments to obtain services without bidding from architects, engineers, land surveyors, photo mappers and transportation planners. The procedures are known as "qualification-based selection," an alternative to the bidding process, but the mayors seek to add pricing information as part of the consideration for such contracts.